A walk in a villa dedicated to the beauty of the arts. Every Monday starting from May 1st untill October 31st the Byblos Art Hotel Villa Amistà, offers the possibility discover the contemporary art at its best. The Management of the Byblos Art Hotel Villa Amistà will be at disposal to offer a guided tour to admire over 100 masterpieces exposed inside the villa. From Marc Quinn to Beatriz Millar, without forgetting Arnaldo Pomodoro and Piero Manzoni… An endless collection with a touch extravagance to EXPOse the Italian beauty to the entire World. All the tours will be free of charge and include a printed list of the major art pieces. Time Table: the tours do nt have a specific hour at which they start. They are upon request. Duration: the tours should last around 1 hour, but they are fully customizable according to the requests. After every tour everyone can access to the Peter’s bar or Pool Bar for a drink! In the heart of Valpolicella, just a few kilometers from Verona, the style of the fashion icon Byblos blends with the classic elegance of Villa Amistà to create a one-of-a-kind location, the Byblos Art Hotel Villa Amistà. With its 59 rooms in Art&Design concept all different one from another, the hotel a new experience on every stay. 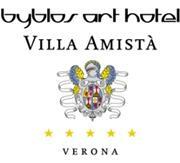 The Byblos Art hotel Villa Amistà, a 5 star Luxury hotel affiliated to the Small Luxury Hotels of the World created from a classical Venetian villa of the XVI Century located in Valpolicella. The elegant structure offers a unique experience of Art&Design, developed by the famous architect/artist Alessandro Mendini, fully decorated by a permanent exposition of contemporary art pieces of the most influential artsts from around the world, such as Jean-Michele Basquiat, Beatriz Millar, Arnaldo Pomodoro, Marc Quinn and Damien Hirst. The completely different 59 rooms offer the a extraordinary and relaxing atmosphere; The wellness center ESPACE Byblos proposes a selection of treatment for both body and soul from both European and Eastern traditions. During the summer months guests can relax also by the pool and enjoy a meal at the Pool Bar. The Ristorante “Atelier” il a place where the local cuisine meets the gourmet techniques to ensure the highest quality and the best creativity. The Wine cella is the ideal place for wine and oils tastings.